Westview Avenue resident and West End Studio Tour (WEST) participant Janet Bell says getting over the fear of sharing your artwork with others is what separates the experienced from the inexperienced artist. “A lot of people fear others will [look at their art] and say ‘It’s crap.’ It’s a fear of people saying what you’re doing is junk. I once had that but I don’t care. I do what I do,” says Bell. West End Studio Tour participant Janet Bell says showing your work makes an experienced artist. Photo by Neil McKinnon. 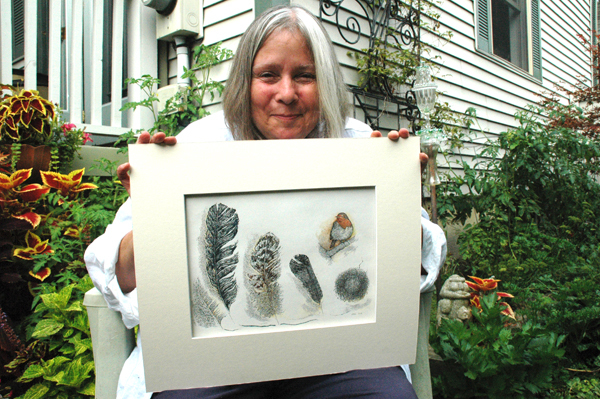 Although the 64-year-old Ottawa native and illustrator grew up in an artistic household, she says simply letting things be nourishes her artist within. Ideas arbitrarily come to her, whether it comes in the form of eye-catching buildings or landscapes. “It has to be in front of me… I never know. The ideas come,” says Bell. Bell met her husband John Bell, now a retired naval officer and her brother’s former roommate, at a Christmas party when he was a university student. At first she says they had nothing in common. Yet they communicated well and she found her non-linear life complimented that of an organized man. While he has never taken up art in their 40 years of marriage, she says he always had an appreciation for it. Their skills work well together: she draws, and he frames. “He’s very structured. I’m so random, abstract. I have become much more knowledgeable about politics and he has become more knowledgeable about art! It works,” says Bell. “It’s always nice to sell [my art] to someone who cares and appreciates it,” says Bell. Some illustrations Bell plans on showing on the studio tour include a series of buildings located in Victoria, British Columbia. Also, nearly completed and sitting on Bell’s desk, is a happy sketch of a clump of grass with all the roots showing, a butterfly, kites flying above, fish underneath in water with a purple sky with the word “serendipity” written across the top. For more information about Janet Bell visit dartmouthinkworks.ca or westendstudiotour.ca.